Toms Skujins is the day's fastest man. The race: Here's the report from third-place Peter Kennaugh's Bora-hansgrohe team. 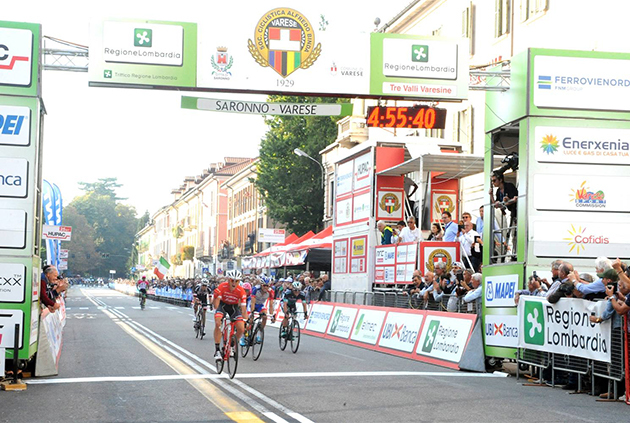 The Italian autumn classic Tre Valli Varesine took the riders over 212km from Saronno to Varese. Much of the race was led by a breakaway of five riders, but with 50km remaining, several riders, including Rafal Majka and Emanuel Buchmann, were able to bridge the gap. As part of a 14-man group, the two BORA – hansgrohe riders rode at the head of the race until they were caught with 28km remaining. The following kilometres were characterised by a series of attacks, and Peter Kennaugh and Emanuel Buchmann were able to put themselves at the head of the race. It all came down to a sprint from a reduced group on the slightly downhill finishing straight, from which T. Skujins emerged victorious. Peter was able to secure a solid third place at the end of the day. 3 KENNAUGH Peter Bora-hansgrohe s.t. 4 WOODS Michael EF Education First-Drapac s.t. 5 FRANK Mathias Ag2r La Mondiale s.t. 9 VISCONTI Giovanni Bahrain-Merida s.t. 10 BRAMBILLA Gianluca Trek-Segafredo s.t. 11 CATTANEO Mattia Androni Giocattoli-Sidermec s.t. 12 KONRAD Patrick Bora-hansgrohe s.t. 14 BENNETT George LottoNL-Jumbo s.t. 17 VILLELLA Davide Astana s.t. 18 OOMEN Sam Team Sunweb s.t. 19 BUCHMANN Emanuel Bora-hansgrohe s.t. 20 NIBALI Vincenzo Bahrain-Merida s.t. 21 REICHENBACH Sébastien Groupama-FDJ s.t. 22 ROGLIC Primoz LottoNL-Jumbo s.t. 23 BARDET Romain Ag2r La Mondiale s.t. 25 BOIVIN Guillaume Israel Cycling Academy s.t. 26 CANOLA Marco Nippo-Vini Fantini s.t. 28 GAVAZZI Francesco Androni Giocattoli-Sidermec s.t. 29 VELASCO Simone Wilier Triestina-Selle Italia s.t. 31 KUDUS Merhawi Dimension Data s.t. 33 ROTA Lorenzo Bardiani-CSF s.t. 34 DÍAZ José Manuel Israel Cycling Academy s.t. 35 TOLHOEK Antwan LottoNL-Jumbo s.t. 36 RAVASI Edward UAE-Team Emirates s.t. 37 PERNSTEINER Hermann Bahrain-Merida s.t. 38 VERONA Carlos Mitchelton-Scott s.t. 39 SCHÖNBERGER Sebastian Wilier Triestina-Selle Italia s.t. 40 BADILATTI Matteo Israel Cycling Academy s.t. 42 ROSSETTO Stéphane Cofidis s.t. 45 SANTAROMITA Ivan Nippo-Vini Fantini s.t. 48 FICARA Pierpaolo Amore & Vita-Prodir s.t. 53 SÁNCHEZ Luis León Astana s.t. 54 TROSINO Mirko Amore & Vita-Prodir s.t. 55 RAGGIO Luca Wilier Triestina-Selle Italia s.t. 57 GABBURO Davide Amore & Vita-Prodir s.t. 58 QUINTANA Dayer Movistar s.t. 59 GAUDU David Groupama-FDJ s.t. 60 CONCI Nicola Trek-Segafredo s.t. 61 OLIVIER Daan LottoNL-Jumbo s.t. 62 FIRSANOV Sergey Gazprom-RusVelo s.t. 64 GESINK Robert LottoNL-Jumbo s.t. 65 GEBREMEDHIN Awet Israel Cycling Academy s.t. 66 COSTA Rui UAE-Team Emirates s.t. 69 MASNADA Fausto Androni Giocattoli-Sidermec s.t. 70 PELLIZOTTI Franco Bahrain-Merida s.t. 72 FEDELI Alessandro Trevigiani Phonix-Hemus 1896 s.t. 73 HERRADA José Cofidis s.t. 74 LADAGNOUS Matthieu Groupama-FDJ s.t. 76 BOUWMAN Koen LottoNL-Jumbo s.t. 80 LATOUR Pierre Ag2r La Mondiale s.t. 81 HAMILTON Lucas Mitchelton-Scott s.t. 82 PEDRERO Antonio Movistar s.t. 85 RIABUSHENKO Alexandr UAE-Team Emirates s.t. 86 DI SANTE Antonio Sangemini - MG.K Vis s.t. 87 GAROSIO Andrea D'Amico-Utensilnord s.t. 88 PUCCIONI Dario Sangemini - MG.K Vis s.t. 89 ALBANESE Vincenzo Bardiani-CSF s.t. 90 BAGIOLI Andrea UAE-Team Emirates s.t. 91 STANNARD Robert Mitchelton-Scott s.t. Course map: Note, to get an idea of the race's location, the Malpensa airport in the lower left of the map is the airport serving Milan.